nothing can drag down a pleasant morning like going to the closet and feeling like you have nothing to wear. that's right, even those of us with bloated closets suffer from outfit blues from time to time! sometimes I can't get more that two items to go together, then I just get frustrated and throw on a dress. which, you know, is really not much of a problem. aaanyway, a recent morning of indecision inspired me to make a practical list of things that are missing from my wardrobe, and I turned that into an August wish list! they are pieces that mix well with all the separates I currently own, and are also stand-alone chic. at least, I think so. 2. ok, I have to admit I already have a black summer hat, but I've been thinking that I need one for the fall. I love this one's embroidered rim. //Modcloth. 3. this necklace is a tiny map of the world! //Modcloth. 4. a colourful floral crown is a must-have accessory. //Flash Floozy. 5. I love a neutral top that's still pretty and feminine. //H&M. 6. a cute pair of cognac flats go with pretty much anything... //H&M. 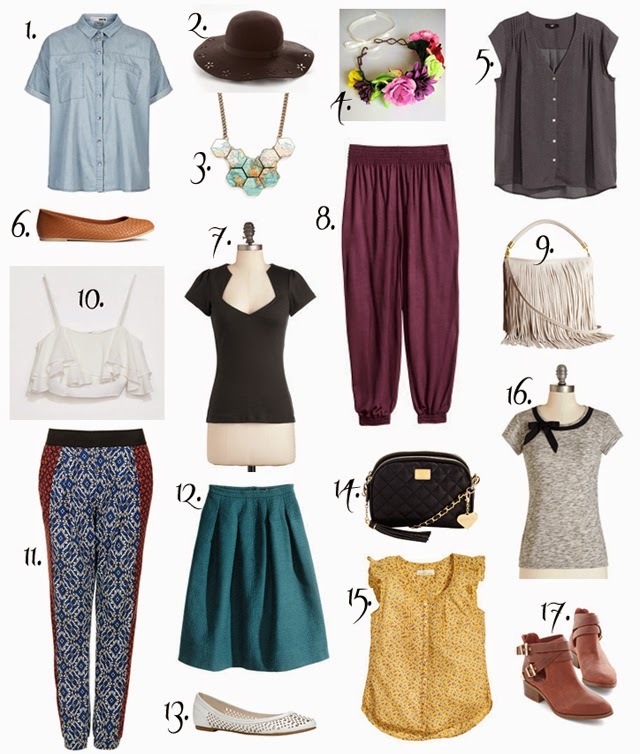 8. harem pants just look so comfy to me! and light jersey material makes them comfy in warm weather. //H&M. 10. my fondness for crop tops is no secret. I love the big flouncy ruffles on this one; they give it a flamenco- dancer look. //Zara. 11. these pants are just too cool for school (although I could definitely transition them into the fall). //Topshop. 12. a teal midi skirt; perfect length in the perfect colour. //H&M. 13. white shoes are lovely in the summer; they look so crisp and fresh. //Aldo. 14. I love my current black handbag, but it would be nice to have a little variety. this one has a classic Chanel vibe. //Topshop. 15. a pretty yellow top to pair with denim shorts, or wear under a sweater in colder months. //H&M. 16. I need to stick more to simple tops with cute details. they're easy mix-and-match pieces. //Modcloth. 17. the most amazing ankle boots to stroll into autumn with! //Seychelles.